Helicobacter pylori is a bacterium that lives in the mucosal lining of the stomach.The infection is very common in Mexico (60 -70%), mainly in adults. The Helicobacter pylori causes inflammation of the mucosa of the stomach (chronic active gastritis) and may persist there for many years. Gastritis is a condition that frequently accompanies ulcers, 95% of patients withduodenal ulcer have H. Pylori and gastritis. What symptoms causes Helicobacter Pylori? Does Helicobacter Pylori cause ulcers? How is the Helicobacter Pylori infection treated? Some patients with gastritis caused by H. Pylori have no symptoms, but in many cases related nausea, gas, bloating, reflux (sourness) or adominal pain. Medications that relieve pain temporarily, but will not cure the inflammation. Eradication of Helicobacter pylori is the only treatment that will cure gastritis. The H. pylori bacterium on its own does not cause ulcers; nevertheless, by weakening the natural defenses of the mucous layer of the stomach, the bacterium makes the stomach more susceptible to damage from acid. When ulcers are treated with conventional antacid, in 60 to 80% of the cases the ulcers return when the medication is suspended. If the H. pylori infection is successfully treated, the layer that protects the stomach from acid (mucous layer of the stomach) is restored making it less probable for the ulcer to return (in 2 to 10%). During the visual examination of the stomach by means of an endoscopy, the physician removes a tissue sample (biopsy), which must be analyzed microscopically by a pathologist. The biopsy result takes 3 days to obtain. A rapid urease test(RUT or CLO test) used for detecting the presence of H. pylori infection can also be done with this biopsy. The result of this last test is generally available within 30 minutes. 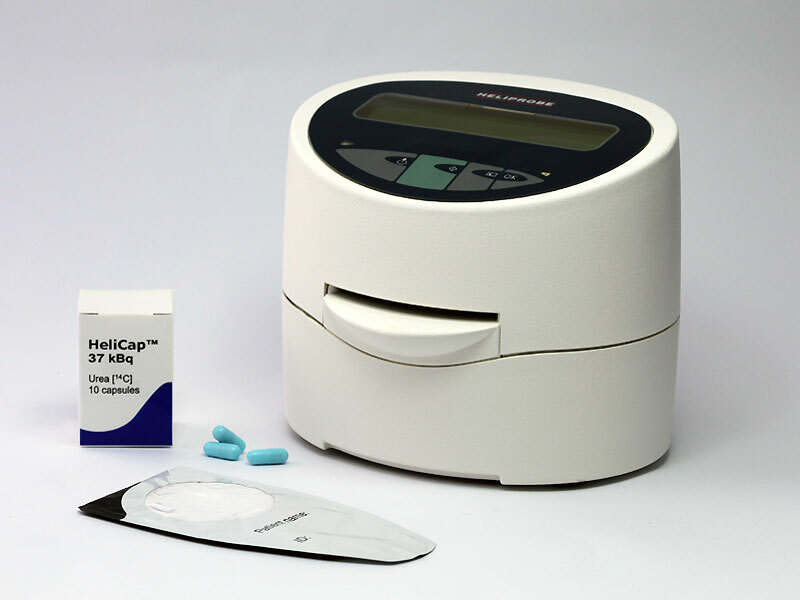 The only non-invasive test used for detecting the presence of the bacterium that can be used clinically to diagnose H. pylori infections, as well as a subsequent follow-up focused on eradication, is the " breath test" (also known as the urea breath test), which is 95 to 98 % accurate, is safe, easy and reliable, and of low-cost for the patient. The H. pyloriinfection is difficult to cure. Currently, the most effective treatment includes a regimen of 2 antibiotics in combination with an inhibitor which decreases the production of stomach acid. This treatment will be indicated by your treating physician, who will explain how to take it, its effects, as well as the length of time these effects will last. It is recommended to repeat the breath test 1 month after completing the entire treatment in order to know if the bacterium is eradicated. *Do not eat or drink for 6 hours before the test. * Do not take antibiotics for 1 month before the test. * Do not take stomach-acid inhibitors for 7 days before the test. * Do not take antacids or H2 blockers for 24 hours before the test.